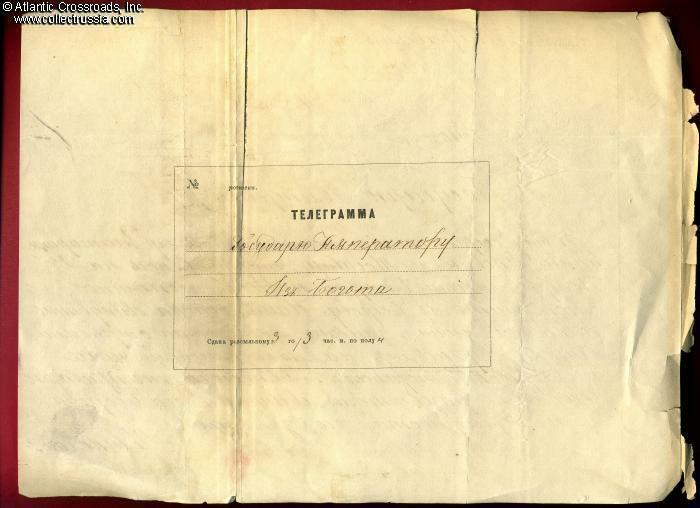 Lot of three 1877 reports from the main front of the Russo-Turkish War addressed to Emperor Alexander II. 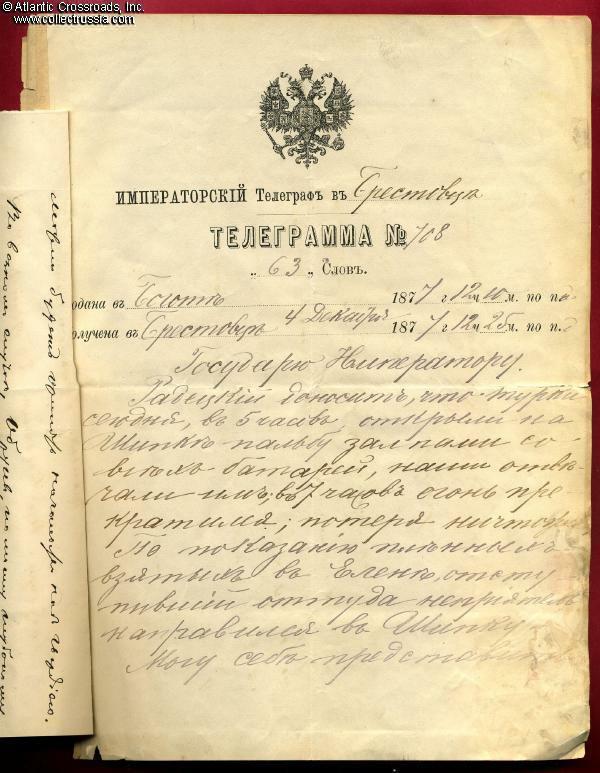 Lot of three 1877 reports from the main front of the Russo-Turkish War addressed to Emperor Alexander II. 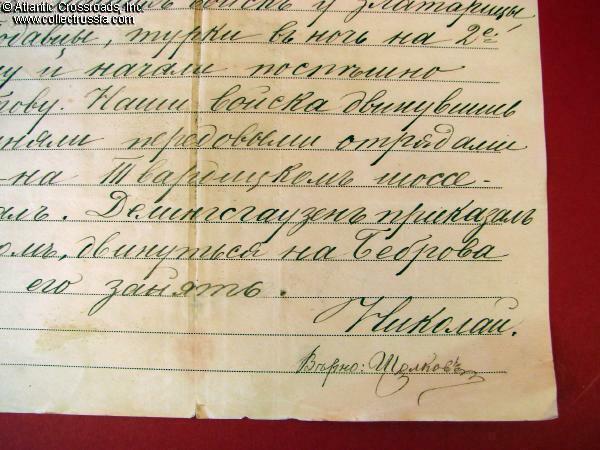 These messages were written and sent via telegraph by Grand Duke Nicholas, Supreme Commander of the Russian Danube Army in Bulgaria. 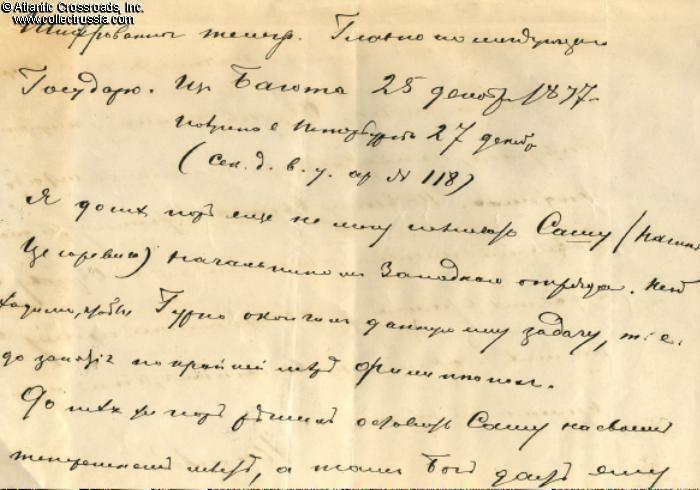 The Grand Duke was also a brother of the Emperor Alexander II; it is rather interesting to see that he used the casual "Ty" (Russian equivalent of the old English "Thou") rather than formal "Vy" when addressing the Tsar - a familiarity inconceivable outside the close family circle. 1. Telegraph message sent from Bogot - location of the field headquarters - to "Paradimp" (obviously, Emperor's HQ). Written in characteristically beautiful calligraphically of the period by a clerk who sent the telegram and signed his name. Dated 3 December 1877 - this and other dates in all the documents are according to the "Old Style", Julian calendar. Full translation of the message is as follows (note that the names of geographical locations are Russian transliterations). "To His Majesty the Emperor. In view of the concentration of our troops near Zlataritsa, Minde, Yakovtsy and Togavtsy, in the early morning hours of 2 November, the Turks set Elena on fire and began a hasty retreat towards Bebrov. Our troops advanced in pursuit and our forward detachments occupied Mareni, Buinovats (on the Tvarditskoe Road), and Bebrovskiy Pass. Today, Delingsgauzen ordered to move at dawn towards Bebrov and to occupy it if possible. Nikolai [Nicholas]". True: [signed]". Note that the November 2 date is a mistake - the Grand Duke obviously meant to say December 2, the day prior to the date of the report. This Julian date of December 3 can be translated into the date December 15 according to the Gregorian calendar used by most other European countries at the time. The report therefore coincides with the critical phase in the war: just 5 days after the surrender of Plvena (on December 10, according to the New Gregorian calendar). The document is in very good condition. Shows 2 vertical folds and has minor separation at the top along one of the folds, minor wear along the edges. Very clean and completely legible. 2. 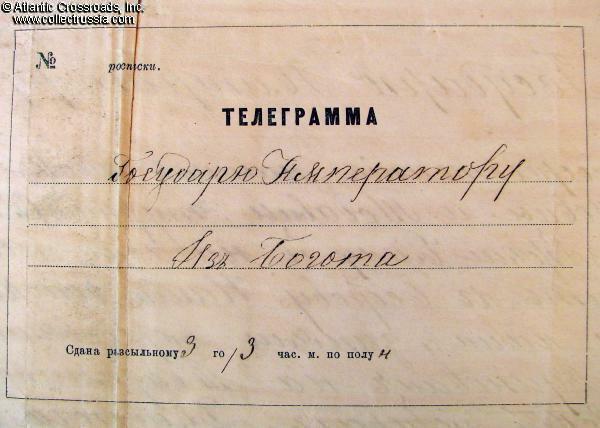 Telegraph message on the blank of the "Imperial Telegraph in Brestovets". Shows Russian double-headed eagle. The handwriting is the same as on the document above. 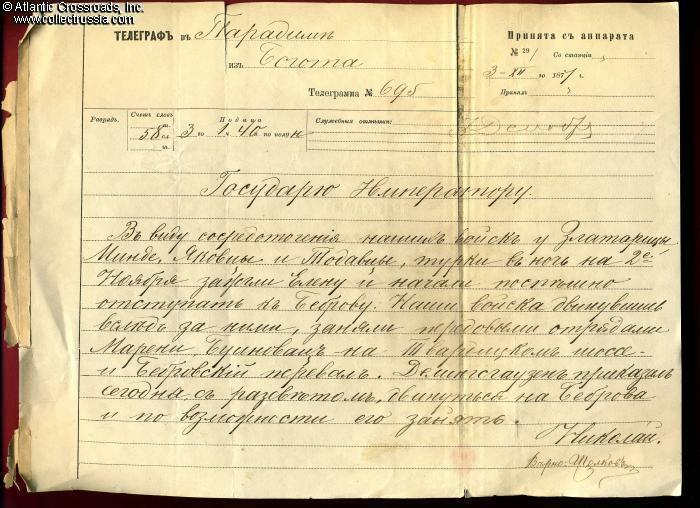 The telegram was sent from Bogot on 4 December 1877. Full text is as follows. "To His Majesty the Emperor. Radetskiy reports that at 5 o'clock today, the Turks on the Shipka [Pass] opened volley fire with all their batteries; our [troops] replied. At 7 o'clock the fire stopped, [our] losses are insignificant. As told by the prisoners taken in Elena, the retreating enemy detachment headed towards Shipka. I imagine your mutual joy during the meeting at Brestovets. May God save You. May the Lord help us to rejoice in more good news. Nikolay [Nicholas]. True: [signed]. The meeting referred to was between Emperor Alexander II and his son, Grand Duke Alexander - future Tsar Alexander III. Alexander II arrived at the village of Brestovtsy near Plevna to take personal command of the campaign, which until then had been conducted in unsatisfactory manner. It is noteworthy that young Duke Alexander was a bitter critic of the Russian high command - including his uncle Grand Duke Nicholas - during the siege of Plevna. Alexander's experiences during the Russo-Turkish war deeply influenced his future rule as Emperor of Russia: the greatest achievement of his reign would be a long period of peace and prosperity. 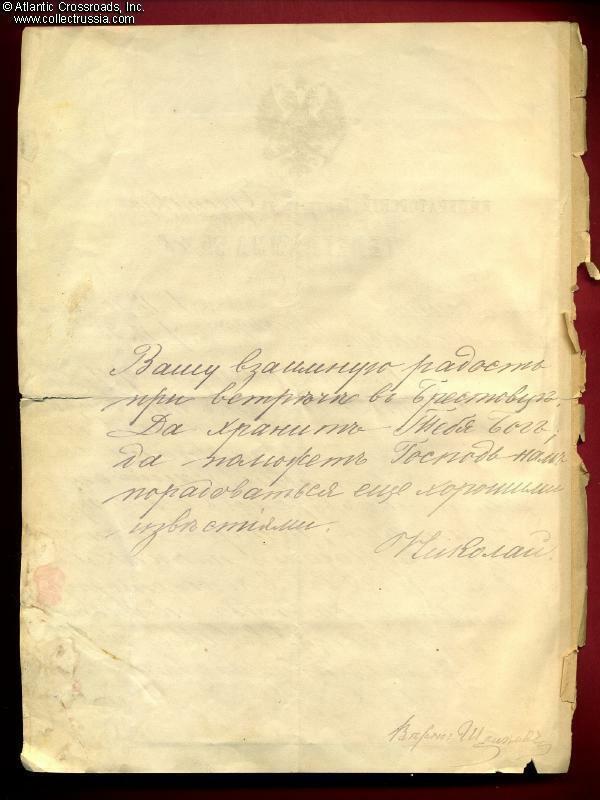 The document is in good condition; has minor stains near the edge but is completely legible. Shows wear to edges but still very presentable. The document has been folded in quarters and has a small separation along the horizontal fold; still very solid overall. Glued to it along the left edge is the document #3 below. 3. 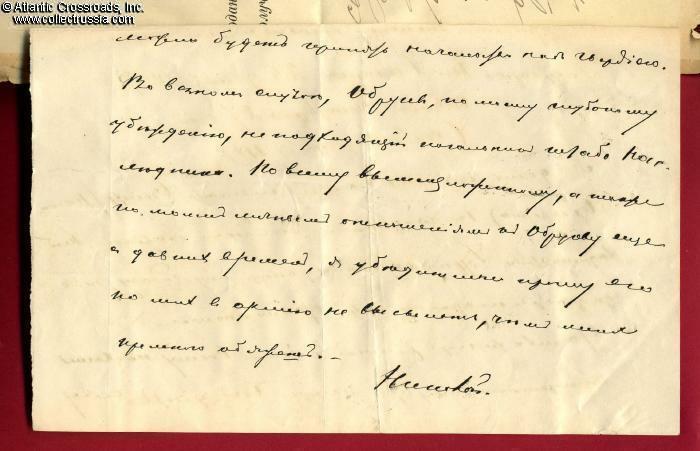 Hand-written note from Duke Nicholas addressed to Emperor Alexander II. 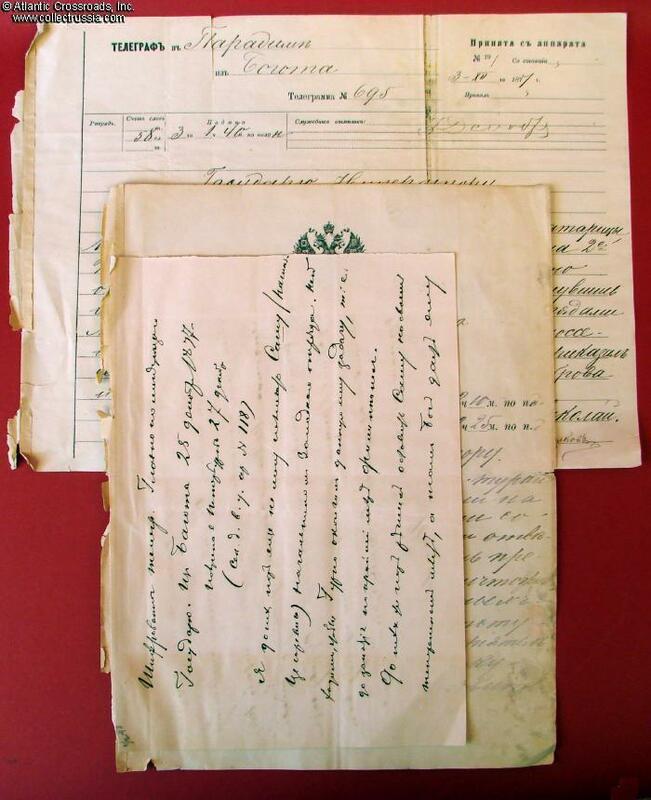 Unlike the other two documents, it appears to be in Grand Duke's own hand-writing. Attached to the telegram #2 above. Full translation is as follows. 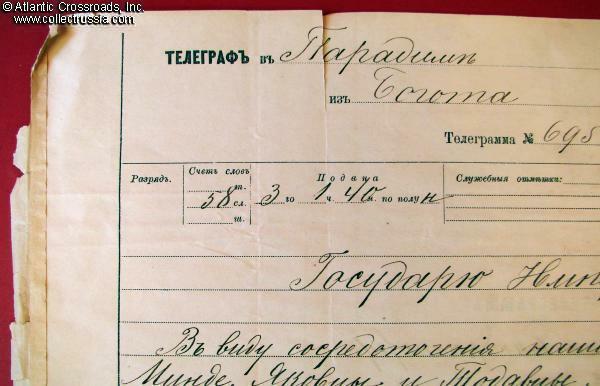 "Coded telegram from the Supreme Commander to the Emperor. From Bagot (sic) 25 December 1877. Received in [St.] Petersburg on 27 December. ...#118. I still cannot appoint [?] Sasha [short form of Alexander](our Tsesarevich) [the Heir] commander of the Western Group [of Troops]. It is necessary that Gurko first accomplish his objective, i.e. at least until the capture of Filippopol [Philipopolis, the old name of the city of Plovdiv]. Until then [I] decided to keep Sasha in his current position; then God bless him, he may take command over the Guard. In any case, it is my strong opinion that Obruchev is not fit to be the Tsesarevich's Chief of Staff. 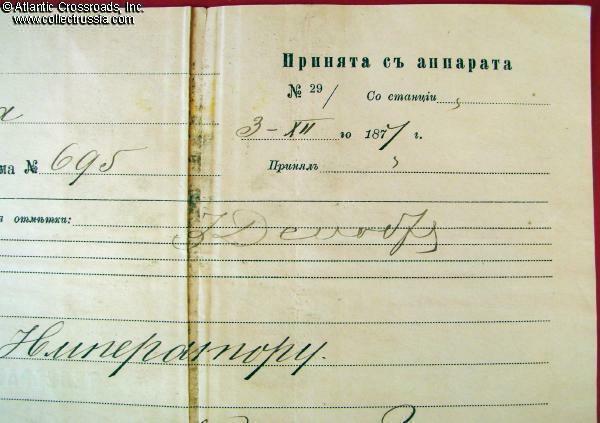 Due to all of the above and also because of my long standing personal history with Obruchev, it is my earnest request that you do not send him to my army, for which I would be greatly obliged. Nikolay [Nicholas]". The date is January 6 according to the new Gregorian calendar - about a week before Gurko's army took the city and inflicted a final crushing defeat upon the Turks in its vicinity. The Russian victory at Philipopolis heralded the surrender of Adrianople, the second capital of the Ottoman Empire, and the rapid Russian advance to Constantinople ending in San Stefano Peace Treaty. The document is in excellent condition, apparently well protected by being attached to the telegram #2 above for safe storage. Light vertical fold in the middle. 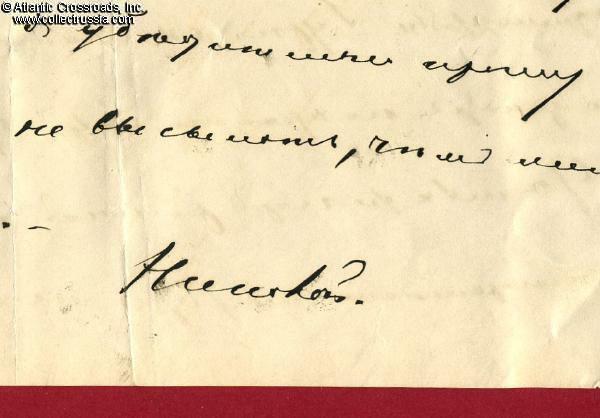 Small pencil mark in the upper left corner, possibly a date left by an archivist. 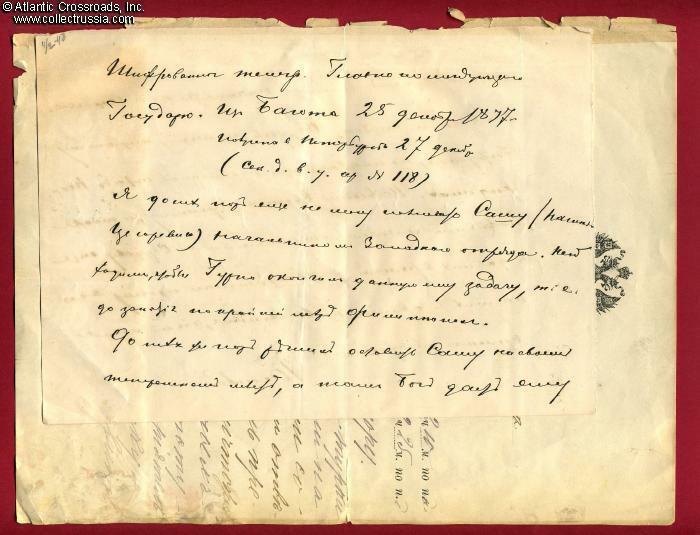 This historic document grouping dates to the decisive phase of the Russo-Turkish war and reveals an interesting personal correspondence between the czar and high command, shedding light on relationships within the Romanov family. Especially given the secret military nature of the materials, such a grouping is a rarity that would be a prize for any military archive, research library or military document collection.